Credit: Falk, Benjamin J., photographer. Copyright 1894. Prints and Photographs Division, Library of Congress. The hope of entering the race for dramatic fame as an individual and single attraction never came into my head until, in 1858, I acted Asa Trenchard in “Our American Cousin"; but as the curtain descended the first night on that remarkably successful play, visions of large type, foreign countries, and increased remuneration floated before me, and I resolved to be a star if I could. A resolution to this effect is easily made; its accomplishment is quite another matter. Art has always been my sweetheart, and I have loved her for herself alone. I had fancied that our affection was mutual, so that when I failed as a star, which I certainly did, I thought she had jilted me. Not so. I wronged her. She only reminded me that I had taken too great a liberty, and that if I expected to win her I must press my suit with more patience. Checked, but undaunted in the resolve, my mind dwelt upon my vision, and I still indulged in day-dreams of the future. During the summer of 1859 I arranged to board with my family at a queer old Dutch farmhouse in Paradise Valley, at the foot of Pocono Mountain, in Pennsylvania. A ridge of hills covered with tall hemlocks surrounds the vale, and numerous trout-streams wind through the meadows and tumble over the rocks. Stray farms are scattered through the valley, and the few old Dutchmen and their families who till the soil were born upon it; there and only there they have ever lived. The valley harmonised with me and our resources. The scene was wild, the air was fresh, and the board was cheap. What could the light heart and purse of a poor actor ask for more than this? On one of those long rainy days that always render the country so dull I had climbed to the loft of the barn, and lying upon the hay was reading that delightful book “The Life and Letters of Washington Irving.” I had gotten well into the volume, and was much interested in it, when to my surprise I came upon a passage which said that he had seen me at Laura Keene’s theater as Goldfinch in Holcroft’s comedy of “The Road to Ruin,” and that I reminded him of my father “in look, gesture, size, and make.” Till then I was not aware that he had ever seen me. I was comparatively obscure, and to find myself remembered and written of by such a man gave me a thrill of pleasure I can never forget. I put down the book, and lay there thinking how proud I was, and ought to be, at the revelation of this compliment. What an incentive to a youngster like me to go on. And so I thought to myself, “Washington Irving, the author of ’The Sketch-Book,’ in which is the quaint story of Rip Van Winkle.” Rip Van Winkle! There was to me magic in the sound of the name as I repeated it. Why, was not this the very character I wanted? An Ameri can story by an American author was surely just the theme suited to an American actor. In ten minutes I had gone to the house and returned to the barn with “The Sketch-Book.” I had not read the story since I was a boy. I was disappointed with it; not as a story, of course, but the tale was purely a narrative. The theme was interesting, but not dramatic. The silver Hudson stretches out before you as you read, the quaint red roofs and queer gables of the old Dutch cottages stand out against the mist upon the mountains; but all this is descriptive. The character of Rip does not speak ten lines. What could be done dramatically with so simple a sketch? How could it he turned into an effective play? Three or four bad dramatisations of the story had already been acted, but without marked success, Yates of London had given one in which the hero dies, one had been acted by my father, one by Hackett, and another by Burke. Some of these versions I had remembered when I was a boy, and I should say that Burke’s play and performance were the best, but nothing that I remembered gave me the slightest encouragement that I could get a good play out of any of the existing materials. Still I was so bent upon acting the part that I started for the city, and in less than a week, by industriously ransacking the theatrical wardrobe establishments for old leather and mildewed cloth and by personally superintending the making of the wigs, each article of my costume was completed; and all this, too, before I had written a line of the play or studied a word of the part. This is working in an opposite direction from all the conventional methods in the study and elaboration of a dramatic character, and certainly not following the course I would advise any one to pursue. I merely mention the out-of-the-way, upside-down manner of going to work as an illustration of the impatience and enthusiasm with which I entered upon the task, I can only account for my getting the dress ready before I studied the part to the vain desire I had of witnessing myself in the glass, decked out and equipped as the hero of the Catskills. I got together the three old printed versions of the drama and the story itself. The plays were all in two acts. I thought it would be an improvement in the drama to arrange it in three, making the scene with the spectre crew an act by itself. This would separate the poetical from the domestic side of the story. But by far the most important alteration was in the interview with the spirits. In the old versions they spoke and sang. I remembered that the effect of this ghostly dialogue was dreadfully human, so I arranged that no voice but Rip’s should be heard. This is the only act on the stage in which but one person speaks while all the others merely gesticulate, and I was quite sure that the silence of the crew would give a lonely and desolate character to the scene and add its to supernatural weirdness. By this means, too, a strong contrast with the single voice of Rip was obtained by the deathlike stillness of the “demons" as they glided about the stage in solemn silence. It required some thought to hit upon just the best questions that could be answered by a nod and shake of the head, and to arrange that at times even Rip should propound a query to himself and answer it; but I had availed myself of so much of the old material that in a few days after I had begun my work it was finished. In the seclusion of the barn I studied and rehearsed the part, and by the end of summer I was prepared to transplant it from the rustic realms of an old farmhouse to a cosmopolitan audience in the city of Washington, where I opened at Carusi’s Hall under the management of John T. Raymond. I had gone over the play so thoroughly that each situation was fairly engraved on my mind. The rehearsals were therefore not tedious to the actors; no one was delayed that I might consider how he or she should be disposed in the scene. I had by repeated experiments so saturated myself with the action of the play that a few days seemed to perfect the rehearsals. I acted on these occasions with all the point and feeling that I could muster. This answered the double purpose of giving me freedom and of observing the effect of what I was doing on the actors. They seemed to be watching me closely, and I could tell by little nods of approval where and when the points hit. I became each day more and more interested in the work; there was in the subject and the part much scope for novel and fanciful treatment. If the sleep of twenty years was merely incongruous, there would be room for argument pro and con; but as it is an impossibility, I felt that the audience would accept it at once, not because it was an impossibility, but from a desire to know in what condition a man’s mind would be if such an event could happen. Would he be thus changed? His identity being denied both by strangers, friends, and family, would he at last almost accept the verdict and exclaim, “Then I am dead, and that is a fact?” This was the strange and original attitude of the character that attracted me. In acting such a part what to do was simple enough, but what not to do was the important and difficult point to determine. As the earlier scenes of the play were of a natural and domestic character, I had only to draw upon my experience for their effect, or employ such conventional methods as myself and others had used before in characters of that ilk. But from the moment Rip meets the spirits of Hendrik Hudson and his crew I felt that all colloquial dialogue and commonplace pantomime should cease. It is at this point in the story that the supernatural element begins, and henceforth the character must be raised from the domestic plane and lifted into the realms of the ideal. To be brief, the play was acted with a result that was to me both satisfactory and disappointing. I was quite sure that the character was what I had been seeking, and I was equally satisfied that the play was not. The action had neither the body nor the strength to carry the hero; the spiritual quality was there, but the human interest was wanting. The final alterations and additions were made five years later by Dion Boucicault. “Rip Van Winkle” was not a sudden success. It did not burst upon the public like a torrent. Its flow was gradual, and its source sprang from the Hartz Mountains, an old German legend, called “Carl the Shepherd,” being the name of the original story. The genius of Washington Irving transplanted the tale to our own Catskills. The grace with which he paints the scene, and, still more, the quaintness of the story, placed it far above the original. Yates, Hackett, and Burke had separate dramas written upon this scene and acted the hero, leaving their traditions one to the other. I now came forth, and saying, “Give me leave,” set to work, using some of the before-mentioned tradition, mark you. Added to this, Dion Boucicault brought his dramatic skill to bear, and by important additions made a better play and a more interesting character of the hero than had as yet been reached. This adaptation, in my turn, I interpreted and enlarged upon. It is thus evident that while I may have done much to render the character and the play popular, it has not been the work of one mind, but both as its to narrative and its dramatic form has been often moulded, and by many skilful hands. So it would seem that those dramatic successes that “come like shadows, so depart,” and those that are lasting, have ability for their foundation and industry for their superstructure. I speak now of the former and the present condition of the drama. What the future may bring forth it is difficult to determine. The histrionic kaleidoscope revolves more rapidly than of yore and the fantastic shapes that it exhibits are brilliant and confusing; but under all circumstances I should be loath to believe that any conditions will render the appearance of frivolous novices more potent than the earnest design of legitimate professors. Acting has been so much a part of my life that my autobiography could scarcely be written without jotting down my reflections upon it, and I merely make this little preparatory explanation to apologise for any dogmatic tone that they may possess, and to say that I present them merely as a seeker after truth in the domain of art. In admitting the analogy that undoubtedly exists between the arts of painting, poetry, music, and acting, it should be remembered that the first three are opposed to the last, in at least the one quality of permanence. The picture, oratorio, or book must bear the test of calculating criticism, whereas the work of an actor is fleeting: it not only dies with him, but, through his different moods, may vary from night to night. If the performance be indifferent it is no consolation for the audience to hear that the player acted well last night, or to be told that he will act better to-morrow night; it is this night that the public has to deal with, and the impression the actor has made, good or bad, remains as such upon the mind of that particular audience. The author, painter, or musician, if he be dissatisfied with his work, may alter and perfect it before giving it publicity, but an actor cannot rub out; he ought, therefore, in justice to his audience, to be sure of what he is going to place before it. Should a picture in an art gallery be carelessly painted we can pass on to another, or if a book fails to please us we can put it down. An escape from this kind of dulness is easily made, but in a theatre the auditor is imprisoned. If the acting be indifferent, he must endure it, at least for a time. He cannot withdraw without making himself conspicuous; so he remains, hoping that there may be some improvement as the play proceeds, or perhaps from consideration for the company he is in. It is this helpless condition that renders careless acting so offensive. I have seen impulsive actors who were so confident of their power that they left all to chance. This is a dangerous course, especially when acting a new character. I will admit that there are many instances where great effects have been produced that were entirely spontaneous, and were as much a surprise to the actors who made them as they were to the audience who witnessed them; but just as individuals who have exuberant spirits are at times dreadfully depressed, so when an impulsive actor fails to receive his inspiration he is dull indeed, and is the more disappointing because of his former brilliant achievements. In the stage management of a play, or in the acting of a part, nothing should be left to chance, and for the reason that spontaneity, inspiration, or whatever the strange and delightful quality may be called, is not to be commanded, or we should give it some other name. It is, therefore, better that a clear and unmistakable outline of a character should be drawn before an actor undertakes a new part. If he has a well-ordered and an artistic mind it is likely that he will give at least a symmetrical and effective performance; but should he make no definite arrangement, and depend upon our ghostly friends Spontaneity and Inspiration to pay him a visit, and should they decline to call, the actor will be in a maze and his audience in a muddle. Besides, why not prepare to receive our mysterious friends whether they come or not? If they fail on such an invitation, we can at least entertain our other guests without them, and if they do appear, our preconceived arrangements will give them a better welcome and put them more at ease. Acting under these purely artificial conditions will necessarily be cold, but the care with which the part is given will at least render it inoffensive; they are, therefore, primary considerations, and not to be despised. The exhibition, however, of artistic care does not alone constitute great acting. The inspired warmth of passion in tragedy and the sudden glow of humour in comedy cover the artificial framework with an impenetrable veil: this is the very climax of great art, for which there seems to be no other name but genius. It is then, and then only, that an audience feels that it is in the presence of a reality rather than a fiction. To an audience an ounce of genius has more weight than a ton of talent; for though it respects the latter, it reverences the former. But the creative power, divine as it may be, should in common gratitude pay due regard to the reflective; for Art is the handmaid of Genius, and only asks the modest wages of respectful consideration in payment for her valuable services. A splendid torrent of genius ought never to be checked, but it should be wisely guided into the deep channel of the stream, from whose surface it will then reflect Nature without a ripple. Genius dyes the hues that resemble those of the rainbow; Art fixes the colours that they may stand. In the race for fame purely artificial actors cannot hope to win against those whose genius is guided by their art; and, on the other hand, Intuition must not complain if, unbridled or with too loose a rein, it stumbles on the course, and so allows a well-ridden hack to distance it. 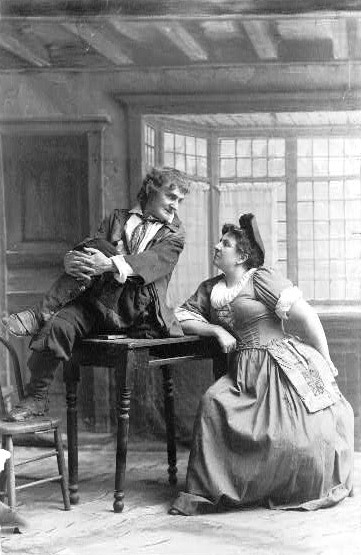 There has lately been a discussion on the subject, in which many have taken part, and one quite notable debate between two distinguished actors, one of the English and the other of the French stage [Henry Irving and Mons. Coquelin]. These gentlemen, though they differ entirely in their ideas, are, nevertheless, equally right. The method of one, I have no doubt, is the best he could possibly devise for himself; and the same may be said of the rules of the other as applied to himself. But they must work with their own tools; if they had to adopt each other’s they would be as much confused as if compelled to exchange languages. One believes that he must feel the character he plays, even to the shedding of real tears, while the other prefers never to lose himself for an instant, and there is no doubt that they both act with more effect by adhering to their own dogmas. For myself, I know that I act best when the heart is warm and the head is cool. In observing the works of great painters I find that they have no conventionalities except their own; hence they are masters, and each is at the head of his own school. They are original, and could not imitate even if they would. So with acting, no master-hand can prescribe rules for the head of another school. If, then, I appear bold in putting forth my suggestions, I desire it to be clearly understood that I do not present them to original or experienced artists who have formed their school, but to the student who may have a temperament akin to my own, and who could, therefore, blend my methods with his preconceived ideas. Many instructors in the dramatic art fall into the error of teaching too much. The pupil should first be allowed to exhibit his quality, and so teach the teacher what to teach. This course would answer the double purpose of first revealing how much the pupil is capable of learning, and, what is still more important, of permitting him to display his powers untrammeled. Whereas, if the master begins by pounding his dogmas into the student, the latter becomes environed by a foreign influence which, if repugnant to his nature, may smother his ability. Many of the shining lights who now occupy the highest positions on the stage, and whom the public voice delights to praise, have often appeared in the dreaded character of omnes, marched in processions, sung out of tune in choruses, and shouted themselves hoarse for Brutus and Mark Antony. If necessity is the mother of invention, she is the foster-mother of art, for the greatest actors that ever lived have drawn their early nourishment from her breast. We learn our profession by the mortifications we are compelled to go through in order to get a living. The sons and daughters of wealthy parents who have money at their command, and can settle their weekly expenses without the assistance of the box office, indignantly refuse to lower themselves by assuming some subordinate character for which they are cast, and march home because their fathers and mothers will take care of them. Well, they had better stay there! But whether you are rich or poor, if you would be an actor begin at the beginning. This is the old conventional advice, and is as good now in its old age as it was in its youth. All actors will agree in this, and as Puff says, in the Critic, “When they do agree on the stage the unanimity is wonderful.” Enroll yourself as a “super” in some first-class theatre, where there is a stock Company and likely to be a periodical change of programme, so that even in your low degree the practice will be varied. After having posed a month as an innocent English rustic, you may, in the next play, have an opportunity of being a noble Roman. Do the little you have to do as well as you can; if you are in earnest the stage-manager will soon notice it and your advancement will begin at once. You have now made the plunge, the ice is broken; there is no more degradation for you; every step you take is forward. A great American statesman said, “There is always plenty of room at the top.” So there is, Mr. Webster, after you get there. But we must climb, and climb slowly too, so that we can look back without any unpleasant sensations; for if we are cast suddenly upon the giddy height our heads will swim and down we shall go. Look also at the difficulties that will beset you by beginning “at the top.” In the first place, no manager in his senses will permit it; and if he did, your failure–which is almost inevitable–not only will mortify you, but your future course for some time to come will be on the downward path. Then, in disgust, sore and disheartened, you will retire from the profession which perhaps your talents might have ornamented if they had been properly developed. He could be witty as well as kind in his remarks. A kinswoman in his company grumbled that the Montreal Herald had called her nose a poem. This full text of Library of Little Masterpieces: 19th Century Actor Autobiographies, edited by George Iles, is in the public domain. Also see: Acting: The First Six Lessons. Page last updated on October 2003. Complete book.